Alec Baldwin as President Donald J. Trump. Everyone knows by now that Donald Trump's favorite tool of communication is Twitter. And early Friday morning, he used that tool to take on a new target: Alec Baldwin. More specifically, the president slammed the actor for his recurring Saturday Night Live impersonation of him. This reaction was sparked by a Hollywood Reporter interview with Baldwin from earlier this week, in which the 30 Rock alum said that impersonating the reality star-turned-politician was "agony." 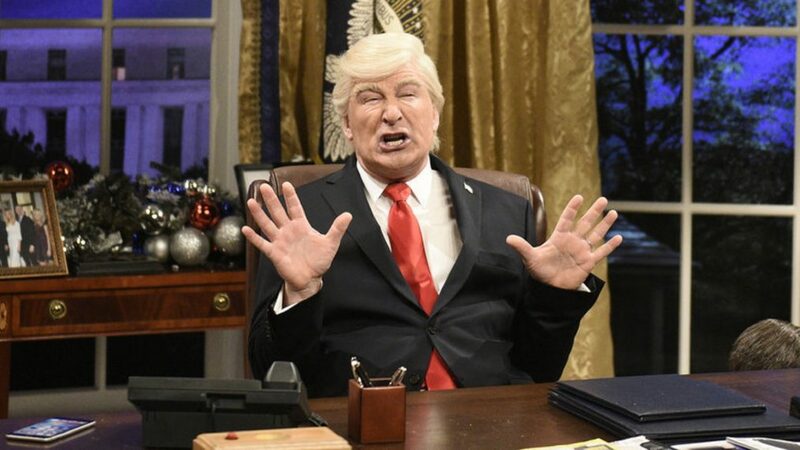 The president's original tweet read, "Alex[sic] Baldwin, whose dieing[sic] mediocre career was saved by his impersonation of me on SNL, now says playing DJT was agony for him. Alex[sic], it was also agony for those who were forced to watch. You were terrible. Bring back Darrell Hammond, much funnier and a far greater talent!" Trump's opinion of Baldwin should come as no surprise, as he's tweeted about the star in the past. However, it was his misspelling of words and the name Alec—calling him "Alex"—that caused social media frenzy. Eventually the president corrected himself, tweeting an edited version. The newly-crowned talk show host was quick to address this statement, and his response can be seen in the stream of tweets below. Putting aside politics, this exchange has us wondering: Which Trump impersonator is better, Baldwin or Hammond? Hammond's impressions of the president were done long before he was voted into office, but they still remain iconic. The Trump administration exposé is coming to the small screen. So where do you stand in the debate? Are you a Baldwin fan or Hammond fan? Sound off in the poll below!